original Quake II game content (the *.pak files) – the engine is under the GPL, the game content is not! And that’s it! (At least in theory, drop me a line if it doesn’t work for you.) Remember to become root before writing to /etc/quake2.conf (you can play as a normal user). Experiment with the cl_stereo_separation value (you can adjust it from the console, no need to restart). I would like to thank John Carmack and id Software for creating Quake II and releasing it under the GPL. If you have any comments or suggestions or maybe you’ve fixed something, please feel free to contact me at this address. 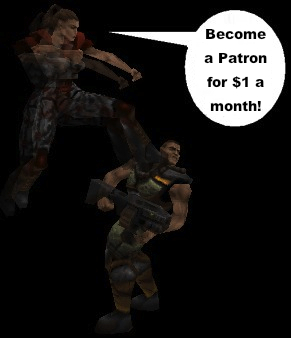 Oh, and if you like Quake II then check out aaquake2 – Quake II in text mode. If you want to play Quake 1 in 3D try this.